magnificent boat, from the pool and its loungers to the luxurious spa. 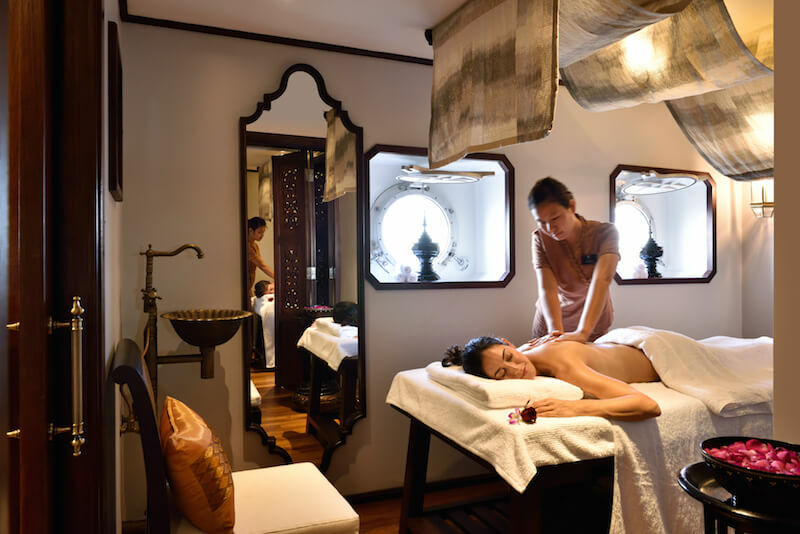 Let all your cares and worries evaporate as you lie beneath the expert hands of one of the on-board masseurs or tuck into authentic cuisine prepared by an award-winning chef. So, what are you waiting for? Built by local craftsmen, this nautical masterpiece features 21 fabulous suites – some of which are the biggest found in Myanmar. Each room exudes a distinct Burmese style that will make you feel right at home as you traverse the country. Quality and comfort are staples throughout all of the suites, from the regular rooms right through to the opulent Owner’s Suite. Every room features an ensuite bathroom filled with L’Occitane toiletries; floor to ceiling windows; and its own private balcony. But, the extravagance doesn’t just stop at the suites. Step out of your room, on to the deck, and prepare to be amazed. When the sun is out (and it almost always is in Myanmar), head to the pool to soak up some rays as you float along the water. Or, turn up the pampering a notch and spend an afternoon rejuvenating yourself with top quality beauty treatments in the Sanctuary Spa by L'Occitane. 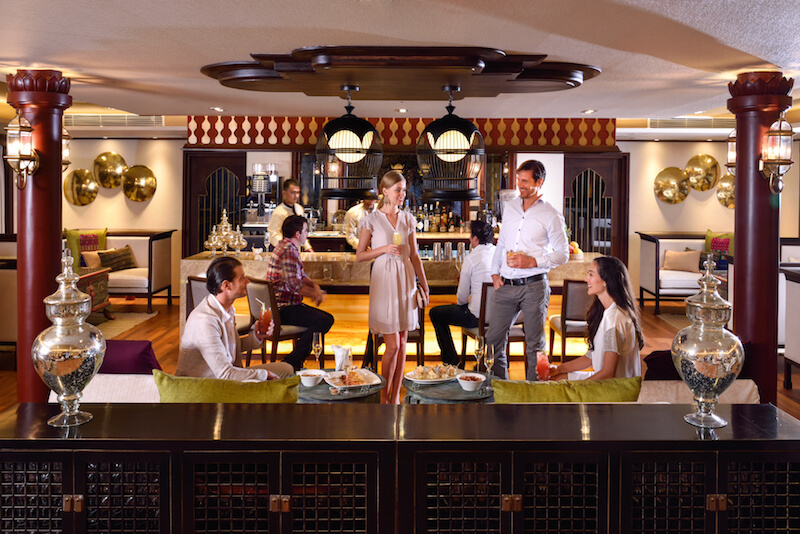 On the Sanctuary Ananda, there is no such thing as over-indulgence. So, what happens when hunger strikes? 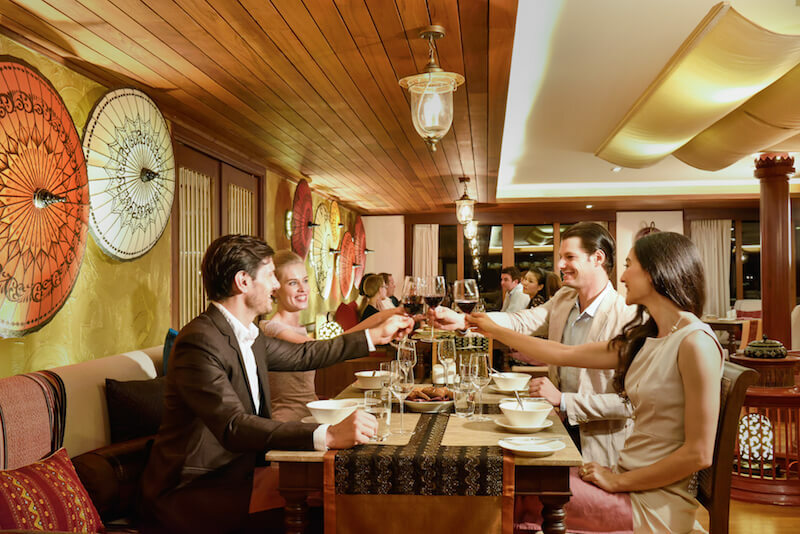 If you are a passenger on the Sanctuary Ananda then you are in luck because their award-winning chef is going to show you the real meaning of gourmet. Get ready to sample authentic Burmese food, infused with lemongrass and chili, cooked to perfection and beautifully presented. If you need a break from the exotic then there are plenty of home comfort options for you to try as well, including burgers, pastas and salads. Wash it all down with a cocktail from the comfort of the deck as the sun sets and you’re in for a perfect night. Unfortunately, not all of us have the luxury of completely disconnecting during our vacation. If you need to stay in the loop while you cruise through Myanmar you will be able to take advantage of the on-board WiFi. Head up in the ship’s library for a bit of peace and quiet while you take care of business. Take note, however, that coverage can be limited outside of the main cities of Mandalay and Bagan. Need anything else? The staff on-board are always more than happy to help and will do everything they can to accommodate your needs. Seeing Myanmar from the vantage point of its powerful waterways offers passengers a unique perspective of this mysterious country. As you sail along the Irrawaddy and other rivers, you will see temples, pagodas and monasteries as well as villages that are hidden in the jungle and ancient ruins that have been left untouched by mankind for centuries. There is no end to the wonders Myanmar presents adventurous travelers. The Sanctuary Ananda has a selection of 6 different itineraries, ranging from 3 – 11 nights. Opt for the lengthier of the trips and you will cover the majority of Myanmar’s most famous sites as well as a number of its less-known, but equally impressive ones. Soar over the world famous temples of Bagan from the comfort of a hot air balloon, explore the bustling market of Bhamo or gawp at some traditional dancing in Shwe Gu. Whatever your interests, there is plenty of these jam-packed itineraries to keep you thoroughly occupied. Naturally, your journey along the waters of Myanmar will be characterized by natural beauty. Relatively untouched due to an old ban on tourism, Myanmar is one of the least spoilt countries in Asia. 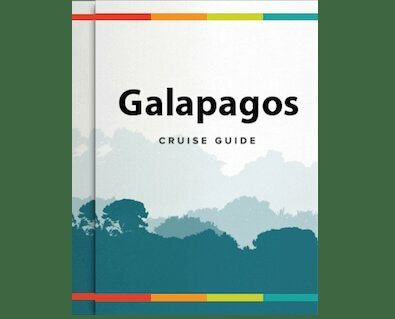 There are huge swathes of jungle, lining the water, that have never even seen a tourist. 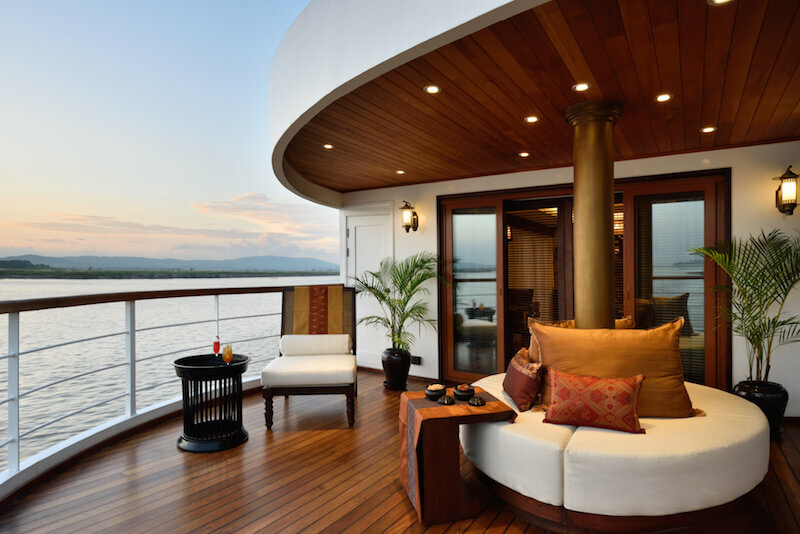 Simply sitting on the deck, admiring the silence of these places is one of the best activities of the cruise. Myanmar is another world and one that you should take the time to discover. Luxury, naturally. This is the motto of the Sanctuary Ananda and a modus operandi that is incorporated into everything they do. 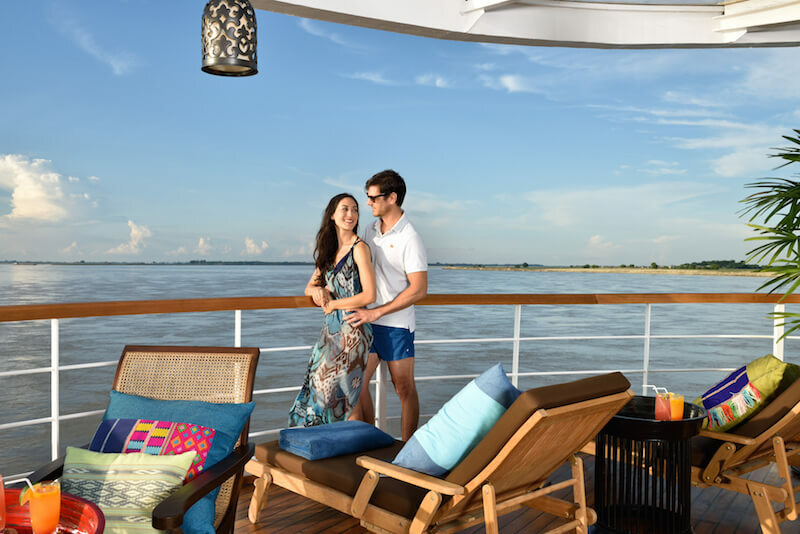 What better way to see one of the gems of Southeast Asia than from the elegant deck of this gorgeous cruise ship.